I've commissioned Mary Profitt of Hamster cage studios https://40kpainting4hire.blogspot.com/ to paint a few Geladan for me. She did an amazing job and here are some pics for you. 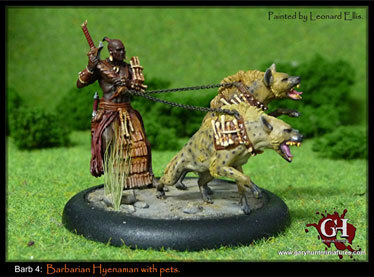 Recent releases to the Hyenaman range: The Feral Hyenaman Afemefuna on his Warbeest and the terrifying Hyenaman Shapeshifter Gnoll. We have released a new version of Beestwars Quick-start! 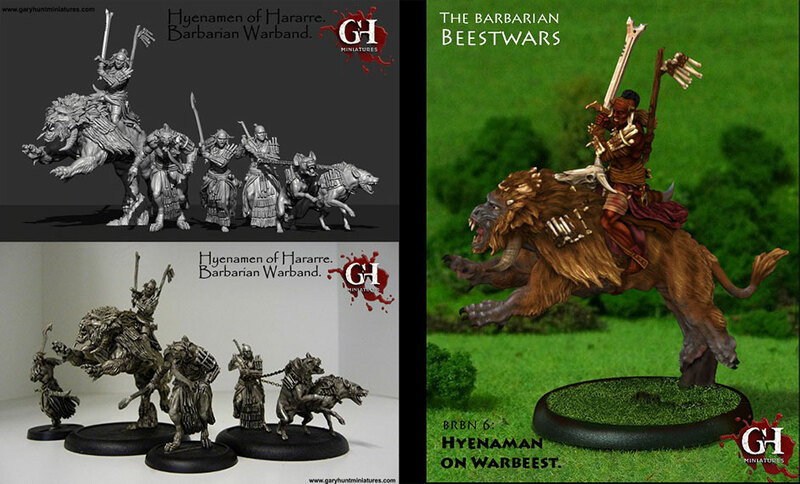 You'll find stats for the new Barbarian hyenamen figures and shamanic magic, new Special abilities, illustrations and more... Download it here. My "Fantasy Warr.." Tabletop RULES are now "live"! And even better, they are FREE. 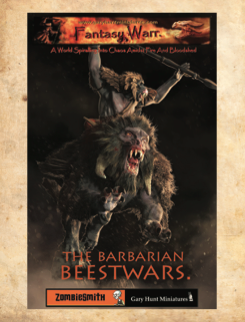 click here for the downloadable PDF, "The Barbarian Beestwars"
It's a pretty big thing for me.. having a rules set for my Miniatures. To coincide with this release we have packaged a couple of starter sets for the first two factions. One for the Clovis and one for the Geladan. 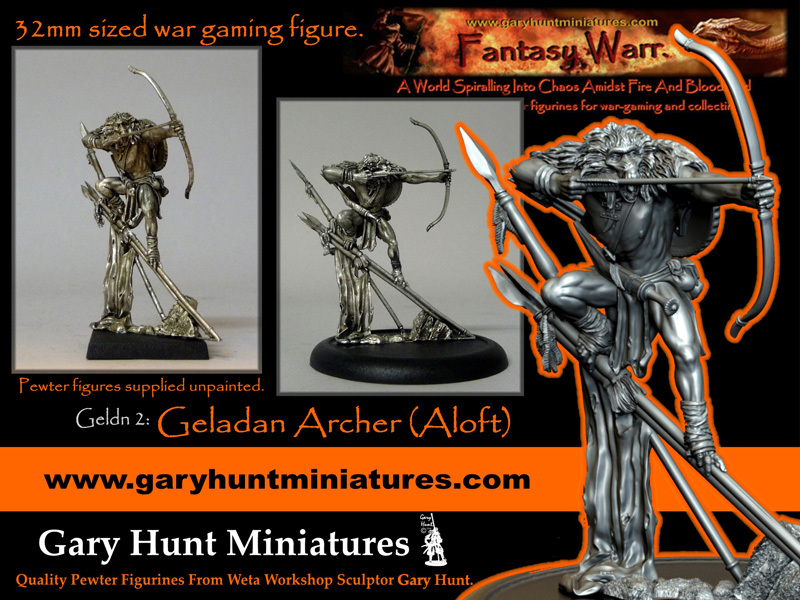 There are a few new Geladan sculpts to pick up as well! These and most of the rest of the range are either supported now or will be very soon. In time as the rules evolve I'll be adding quite a few figures and factions to the range and with Zombiesmith and Doug Redpath's help we'll keep the rules updated to cover them! Bounding forth from the forests of the Simien Mountains we have some more Geladan (baboon men) releases. 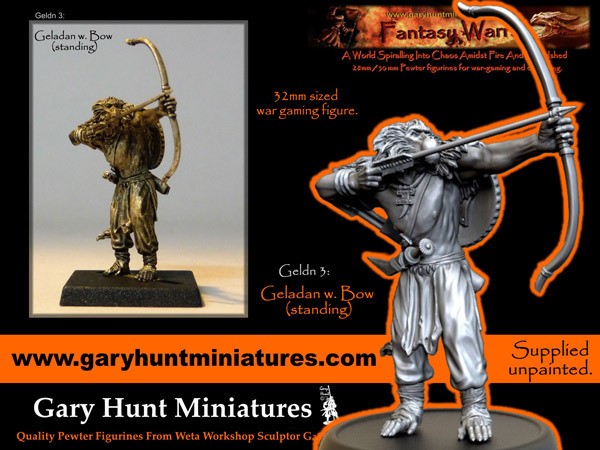 You can find them here https://garyhuntminiatures.com/_fantasy_geladan.html. 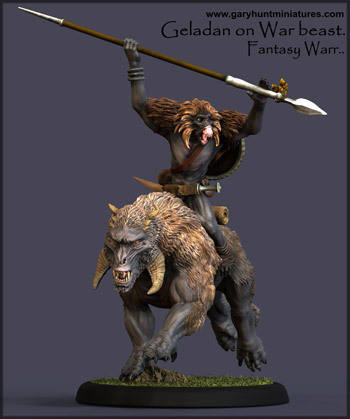 Now available : Geladan : Baboon men of Simia. 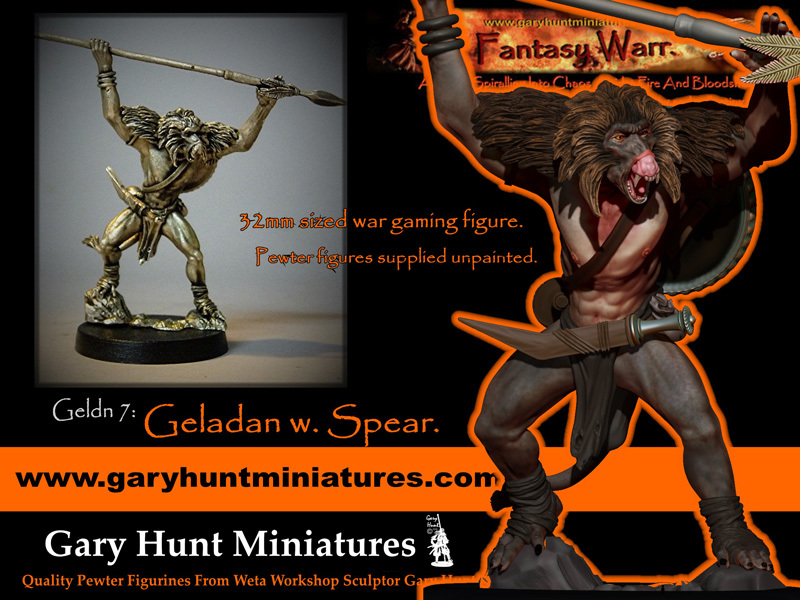 https://garyhuntminiatures.com/_fantasy_geladan.html And more on their way.. 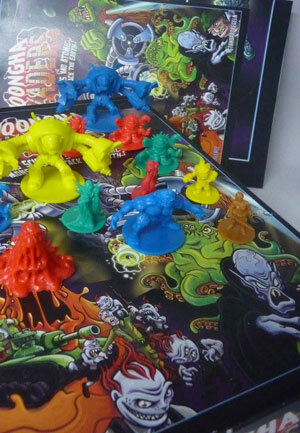 The board game Moongha Invaders has now been released and I've received a copy from Martin and Julia Wallace of Treefrog games. This was a fun project and great to share sculpting responsibility with my old friend Anton Ducrot of Flytrap Factory (he sculpted the Human characters) Here's a pick of the box and the pieces I sculpted cast in glorious technicolor. 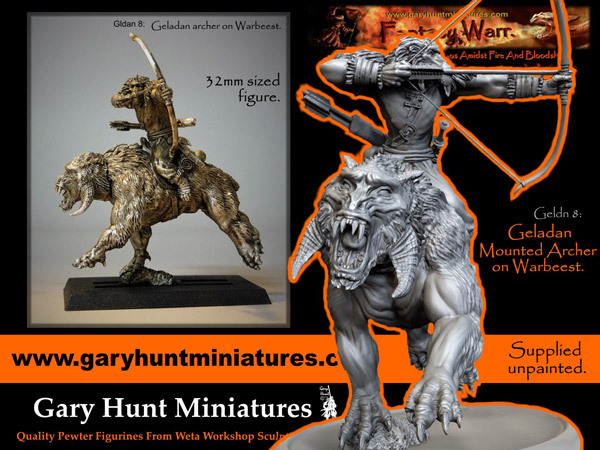 As you may know Gary Hunt Miniatures has teamed up with Zombiesmith miniatures to distribute throughout America. Zombiesmith along with Flytrap Factory and a group of small bespoke miniature/gaming companies get together for a series of pod-casts. They twisted my arm! 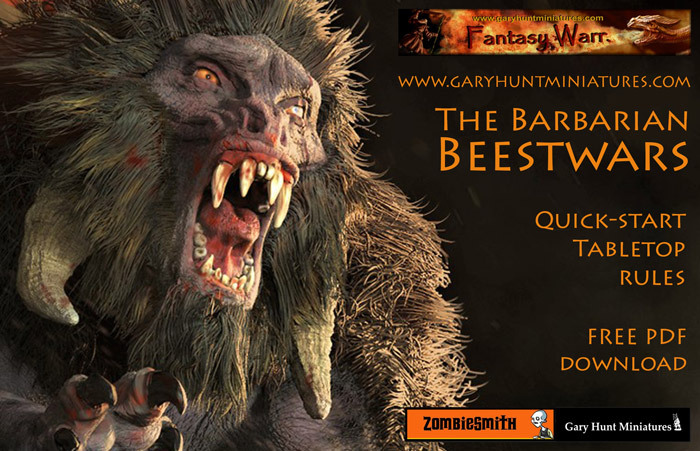 Ep06... 17/12/2015 'The Brotherhood Of The Fly' proudly presents a special impromptu Christmas episode with fellow brother, sculpting veteran and miniatures master Gary Hunt of 'Gary Hunt Miniatures'. Join us as we delve into the behind the scenes world of special effects and film orientated sculpture and design through his long term association with Weta Workshop as well as a behind the scenes look at his own stalwart New Zealand operation that has provided collectors and enthusiasts with highly exquisite and original sculptural masterpieces for many years. 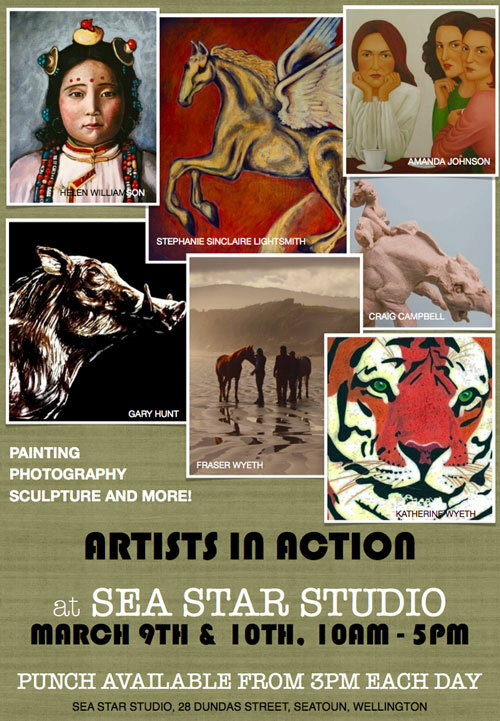 Look out for me, or two small plinths full of my miniatures at the Academy galleries, 1 Queens Wharf, Wellington, 4th-12th June. I'll be joining the many New Zealand artists of the White Cloud Worlds and also a Weta Workshop Giant Killer Robot Exhibition. The die is cast. 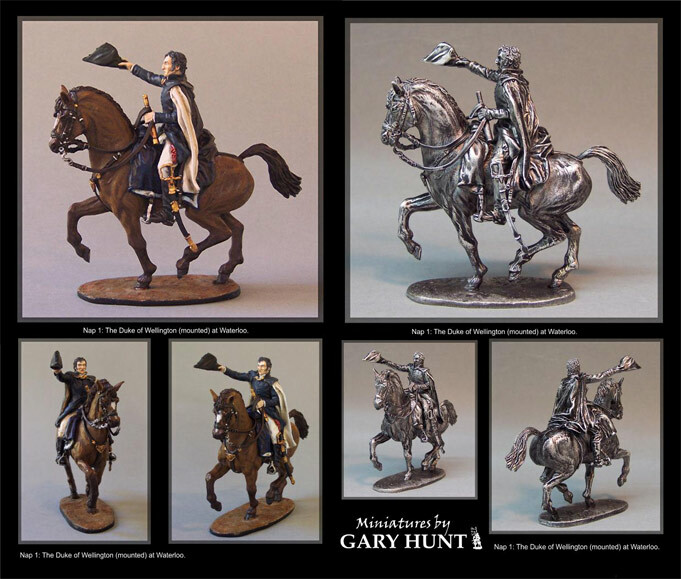 Gary Hunt's Miniatures are heading Stateside! 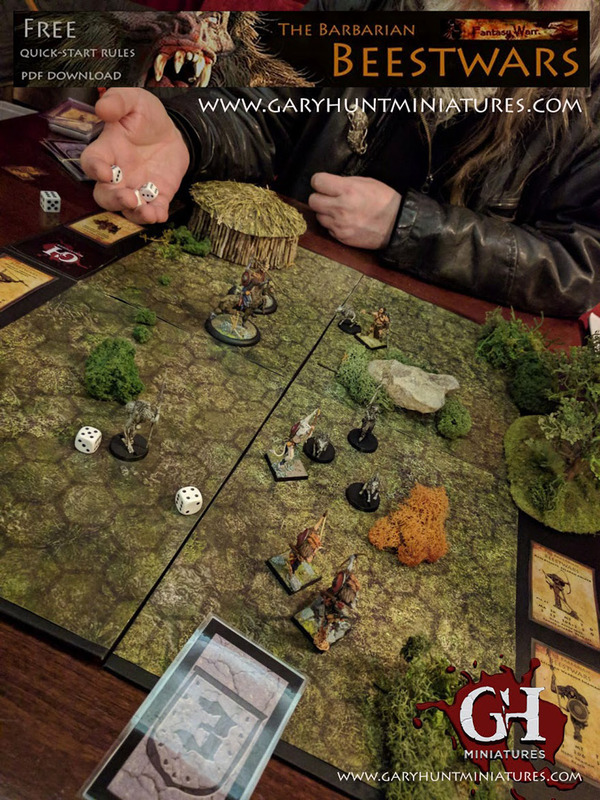 WELLINGTON, New Zealand - March, 2015 Gary Hunt Miniatures is excited to announce a new partnership with Zombiesmith, the U.S. based producer and distributor of war-gaming miniatures. The scene is set for a re-release of the 'Fantasy Warr' range, followed soon after by the pulp sci-fi "21st Century Amazons" collection. 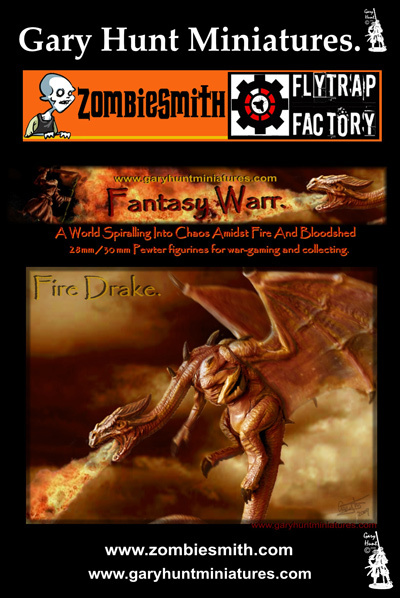 GH mini's will be available from Zombiesmith this April, starting with the Fire Drake. In addition, Gary has many new and soon to be revealed designs in the works. Look out for Zbrush digital renders, workbench photos and more in the coming months. 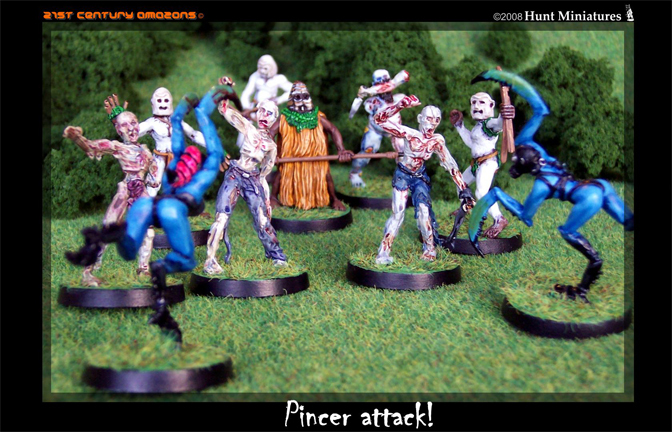 "I'm really thrilled to be working alongside Zombiesmith," said Gary Hunt, founder of GHM. "The partnership will allow me to focus fully upon producing new content for gamers and collectors. New miniature lines will join a whole host of future creations including, terrain, vehicles and rules sets." 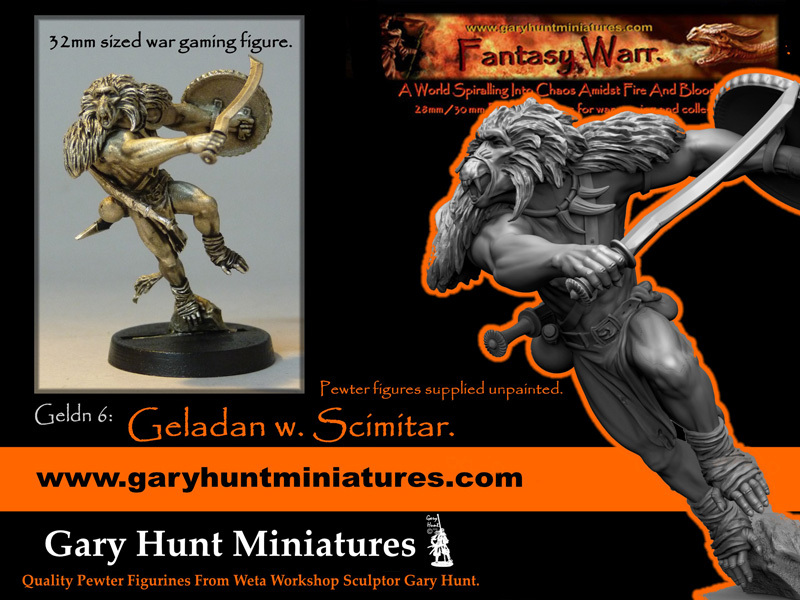 New Zealand based Gary has been producing war-gaming miniatures since 1995. His first job was with Grenadier U.K. 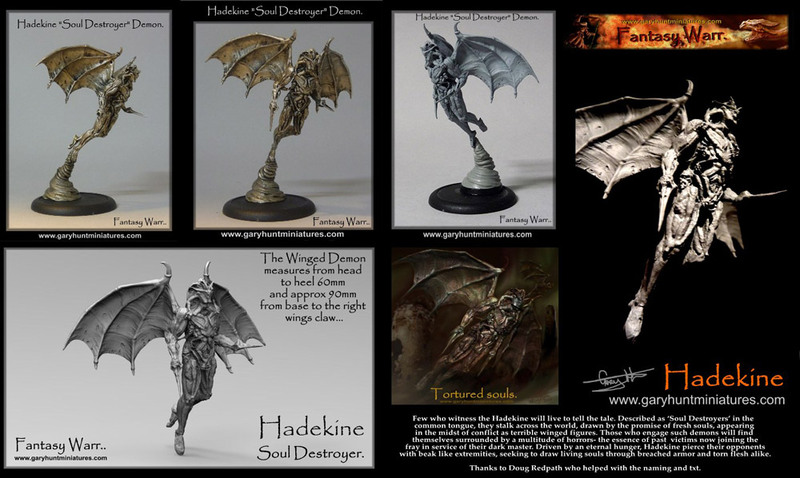 He has subsequently collaborated with Anton Ducrot (Sculptor and founder of Flytrap factory - recently partnered with Zombiesmith) on numerous projects. They stay in regular contact and can often be found sharing thoughts and ideas regarding both the miniatureâ€™s world and the film industry of which they are both part. Gary has worked for Weta Workshop as a Sculptor/Designer for 15 years now and has been part of numerous films such as Lord of the Rings, Avatar, King Kong and the Hobbit. 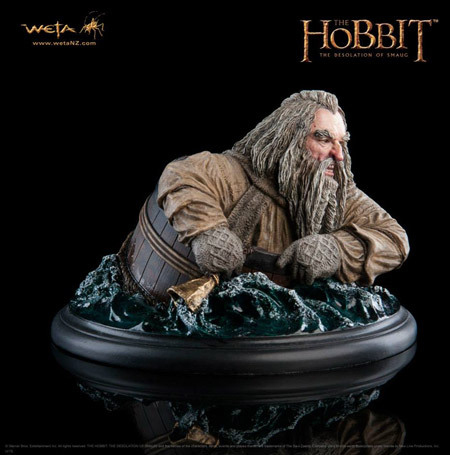 He has also sculpted many of the Weta collectibles range. 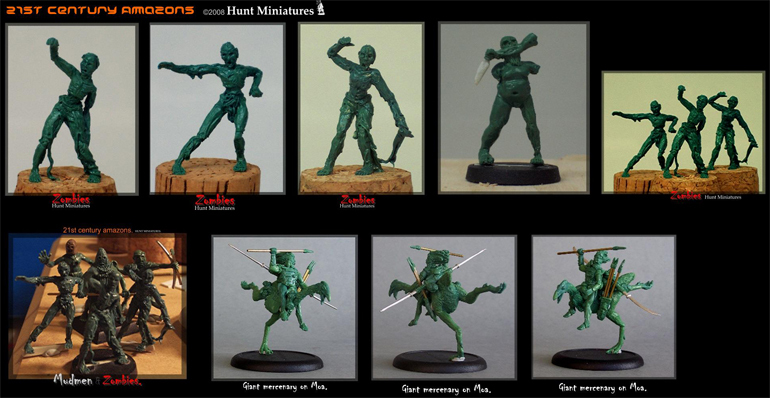 U.S. based Josh Qualtieri of Zombiesmith has been releasing cool and quirky miniatures for almost 15 years, providing fun figures and energised rule sets. Joshua spent 17 years in Feature Film Animation working on such films as Wall-e, Brave and Ratatoille before deciding to make games full time. ZS teamed up seamlessly with Flytrap Factory last year and is excited about this new pairing. New Releases early 2015: Some of these may have already just been released in my web shop as they have now been cast, so have a look around. A full release with Ink-washed or painted miniature photos will appear around January A.s.a.p. 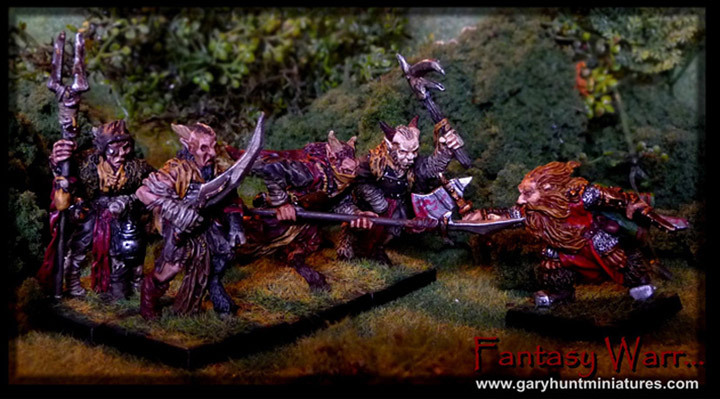 Barbarians, Armoured Minotaur, Wizard, Elf and a Clovis (Minotaur) pendant added to the "Fantasy Warr.." range And a Sir Francis Drake added to the 54mm Historical range. 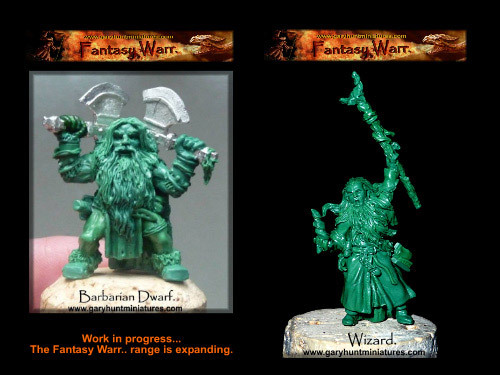 The Dwarven Barbarian is now available as part of My Fantasy Warr.. range https://garyhuntminiatures.com/_fantasy_dwarves.html and the Wizard with a few others will be available asap. 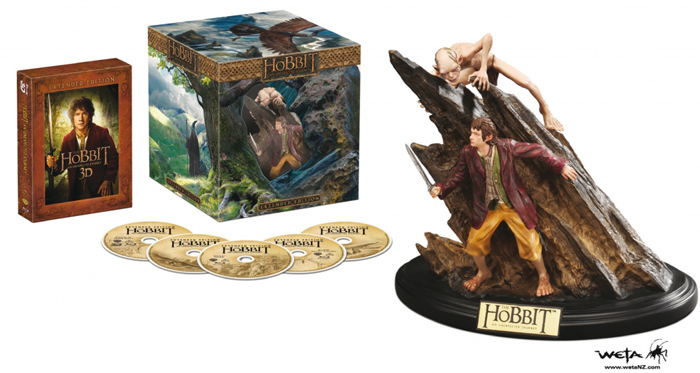 These Hobbit, "The desolation of Smaug" collectibles were previewed at the San Diego Comicon recently. 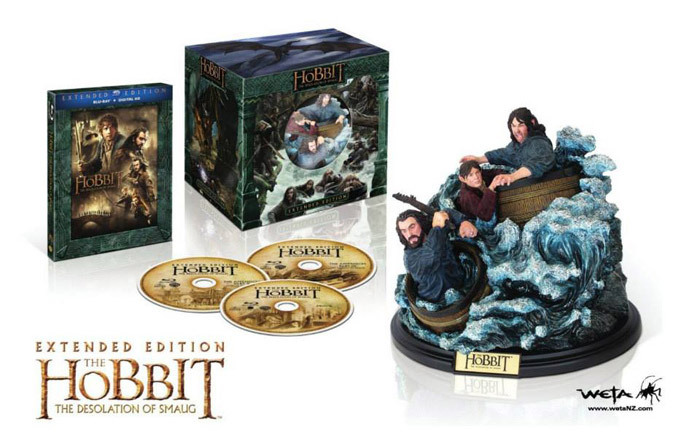 From left to right we have the large Smaug sculpture, Thror on Throne, Bard the bowman and the Smauglette. This year has gone by in the blink of an eye! 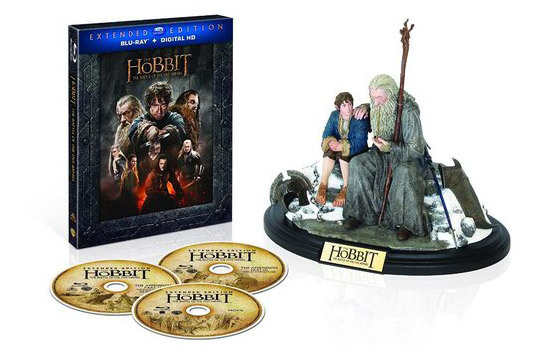 It was great to see my work on the Hobbit and Elysium and I've been kept busy on many projects at Weta including some more collectables: the DVD special edition sculpt of Gollum and Bilbo and a few to be announced soon. A lot of my work recently has moved over to the digital dark side and is as rewarding as physical sculpting. 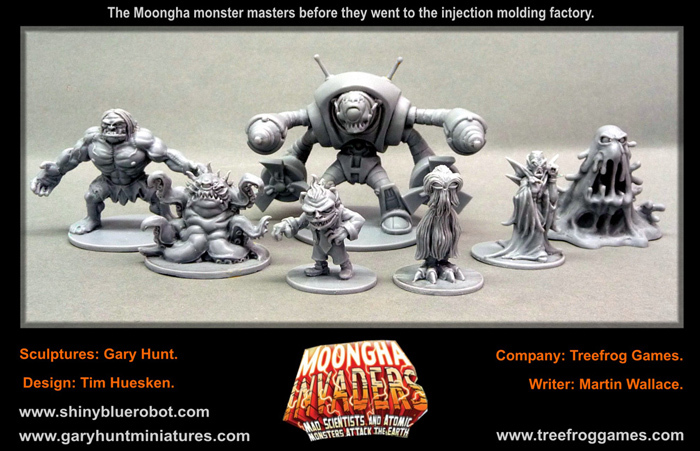 Outside of Weta I have produced many sculpts for a boardgame (Moongha Invaders) been part of an exhibition and sculpted/kitbashed and painted scale models for an Aztec museum piece. I've just released 5 X 1/32nd scale historical figures for my range and have many figures for all my ranges on-the-go or just chomping at the bit to get sculpted! There are 5 new releases in the 54mm Historical range: 4 of them fall under the New Zealand Wars catagory and 1 in the Zulu range. I'll post painted pics asap. I recently converted a large order of my 54mm historical figures for a customer and had them painted by Regal toy soldiers, they did a great job. Some of the conversions were more substantial than others and from this I molded 5 new figures that are now available on my website. 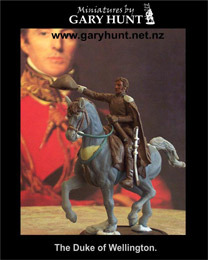 A Zulu and 4 New Zealand Wars figures: Maori warrior, armed constabulary and a bush ranger. I was approached by Te Mahi model makers to sculpt/kit-bash and paint 15 Aztec farmers for the Te Papa Aztec exhibition: Conquest and glory. I couldn't resist so here are some pics of the model chinampas (floating gardens of Mexico). The exhibition is in Wellington from 29 Sep 2013 â€“ 9 Feb 2014 and features many artifacts that are rarely seen around the world and have certainly never been seen in New Zealand. 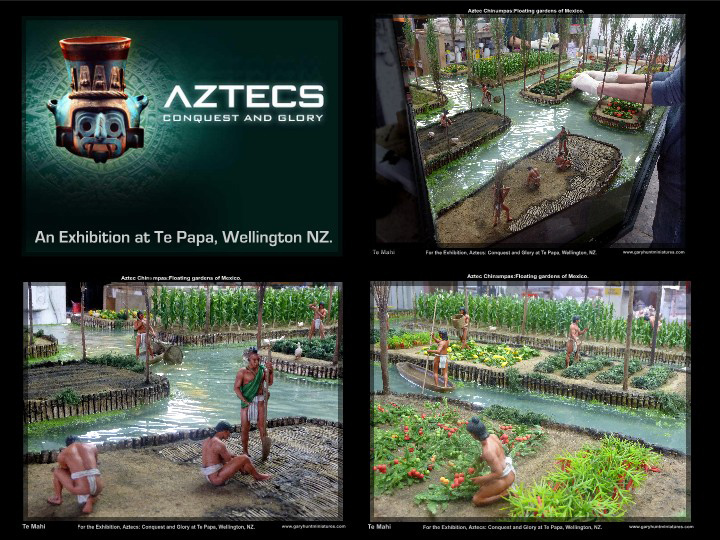 You can see more photo's of the chinampas models on the Te Papa blog https://blog.tepapa.govt.nz/2013/09/24/aztecs-gardens-in-the-lake/ and read some interesting facts about the gardens in the lake. The Hobbit Artisan Market, for the week of the premier was great fun, Thanks to everyone that turned out, stopped by and bought stuff. Here are some pics. 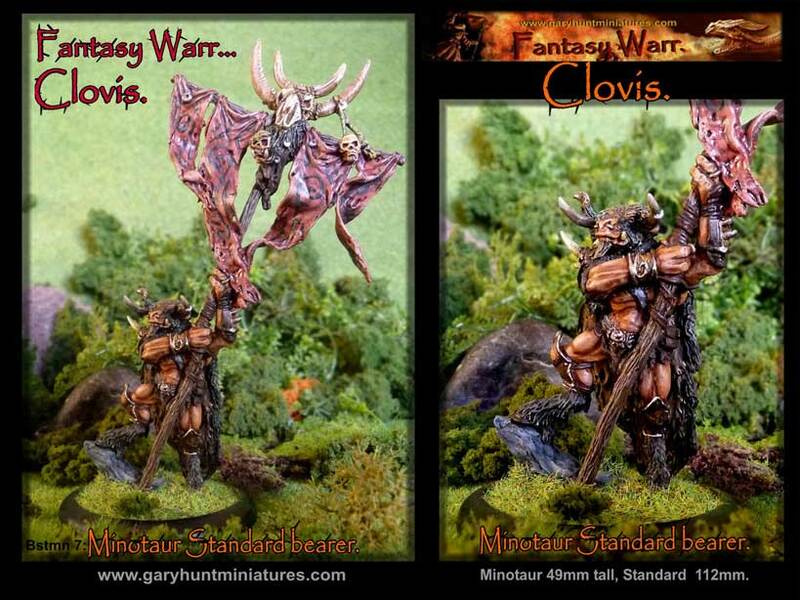 More Clovis Minotaurs and Satyr are on the way. 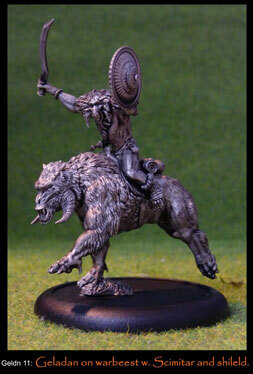 The 2 new Minotaurs have grown in stature and stand between 45-49mm tall. The standard itself is 112mm to the top. These are multi part kits (the standard bearer comes in 6 parts) so you'll be able to swap heads etc just like the smaller minotaurs and beastmen I've released previously. I'll be adding pics of assembled and inked/painted figs to my facebook pages asap. 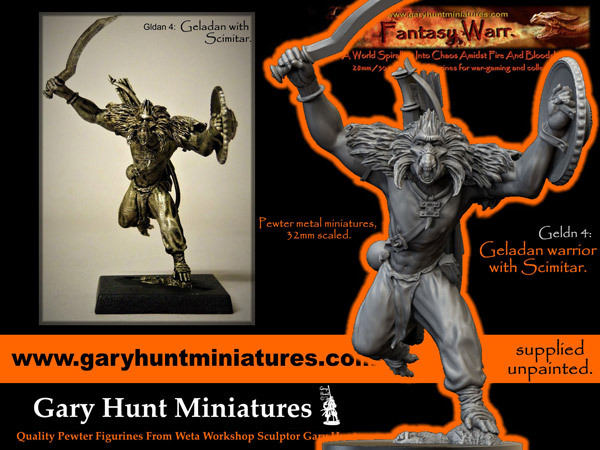 If you are in England I can distrubute from Gary Hunt Miniatures in Somerset, order through my website and I will refund the postage difference. Its real busy at the Workshop these days but i've found some time to release a few more figures. 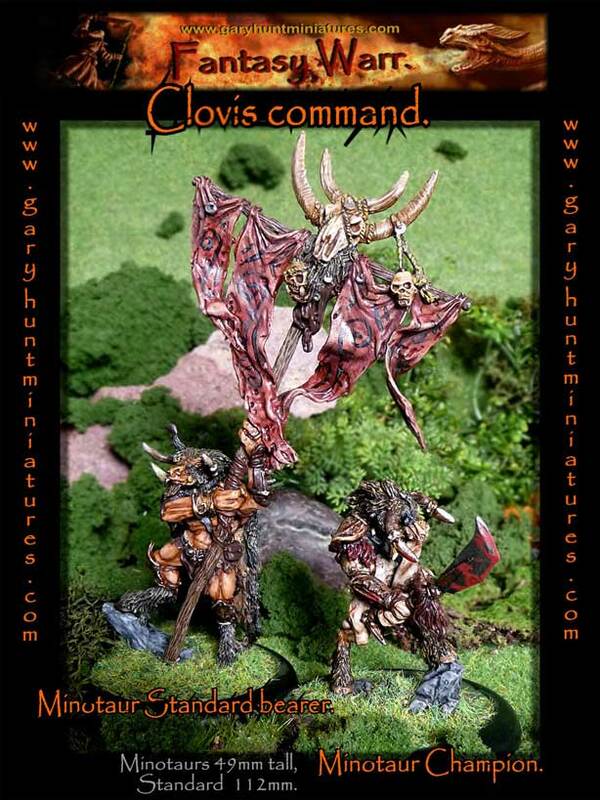 Fantasy Warr (28mm) : Some Clovis Beastmen Lords are on the way...Fully armoured with seperate heads, shields and weapon arms. 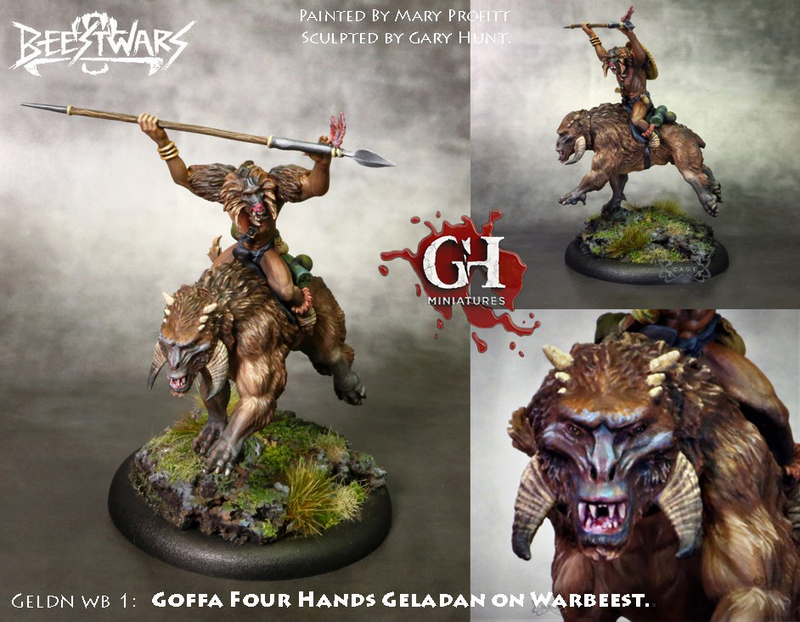 Great for creating a number of poses and characters to lead the army of Clovis beastmen and minotaurs that are already available in the range. 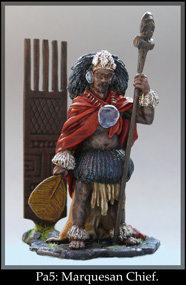 54mm Historical Miniature: The Marquesian Chief will be available soon. This regal Polynesian lord is holding his staff of office and also a fan, he is dressed in ornate feathers and a long cloak. 54mm Pilots: Regal toy soldiers have been painting up copies of my Pilots in traditional toy lead soldier glossy finishes, these will be appearing on the website soon. 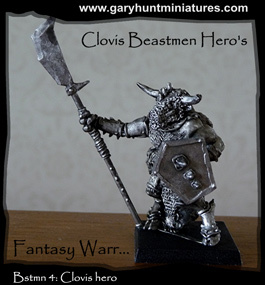 Clovis beastmen and Minotaur Hero's coming soon.. I've also got a few shows at the start of the year and i've finished a few more figs that will be molded and cast shortly, so stay tuned...All the best for 2011, Gary. 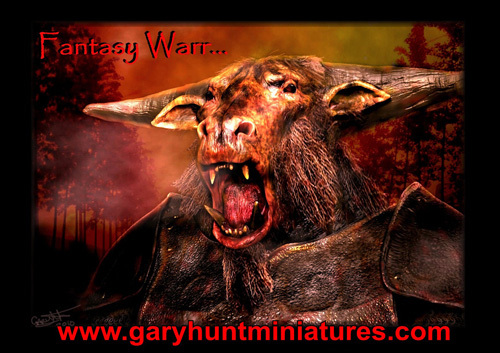 Gary Hunt Miniatures is also on Facebook. 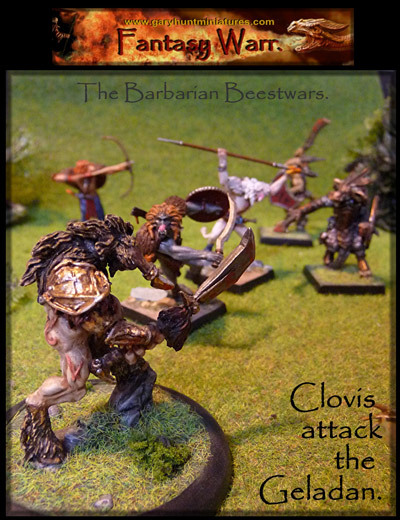 28mm/30mm Fantasy Warr: Beastmen...Minotaurs and Clovis. I'll be attending Natcon10 (NZ national wargaming convention Upper Hutt) on April 2,3 and 4. Game demos will be held with my sci-fi figures, these and all 28mm and 54mm ranges will be on sale. 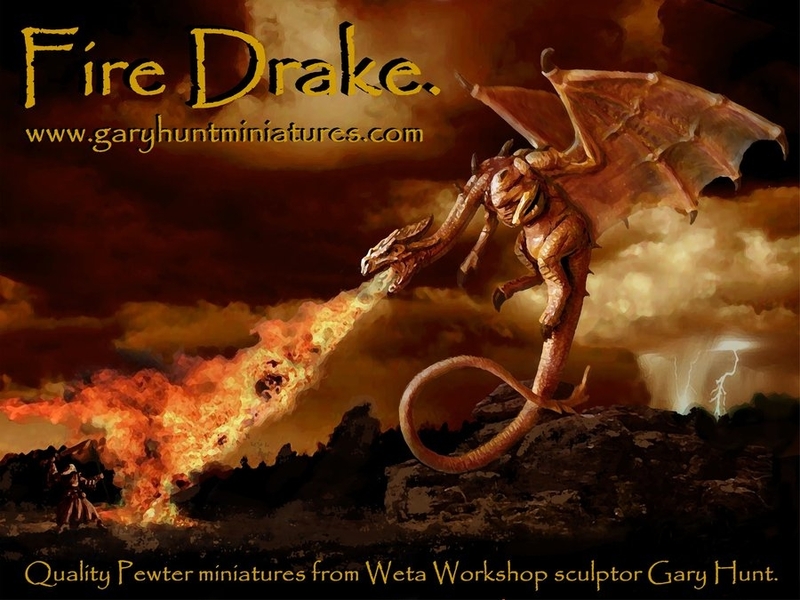 I'll also be doing a Sculpting Demo at the Weta cave in Miramar, (Wellington, NZ,) Saturday April 3 and its the official launch of the assembled, signed and numbered Fire Drake (Dragon). 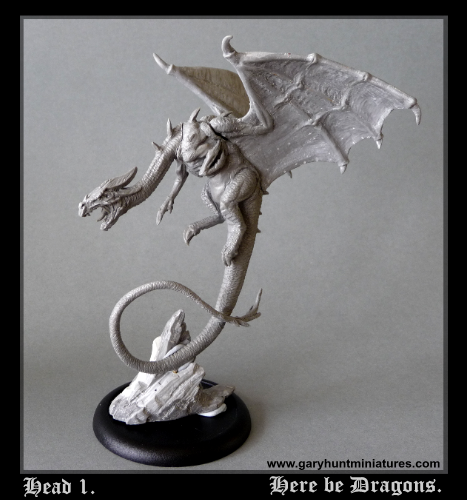 The assembled pewter, ink-washed Fire Drake can now be purchased from the Weta Cave. (Weta Workshop Miramar Wellington, NZ) along with inked versions of my sci-fi figures. The drangon is signed and numbered with a wooden base of NZ Rimu. The Fire Drake will be available on this website for US$30 after Xmas, in the meantime if you would like to purchase it you can e-mail me on [email protected] and i will send you a Paypal invoice. I will however be out of office from the 18th Dec til 4th Jan. I will be checking e-mails over this period....Happy Xmas everyone and thanks for your support. Please note the photoshop version of the Fire Drake above is not in scale with the wizard enveloped in flame. The height from base to tip of wings is 114mm. Here is a sneek peek at my new Dragon ( excuse the blu-tac) It is currently being molded and will hopefully be available from my website in Dec. 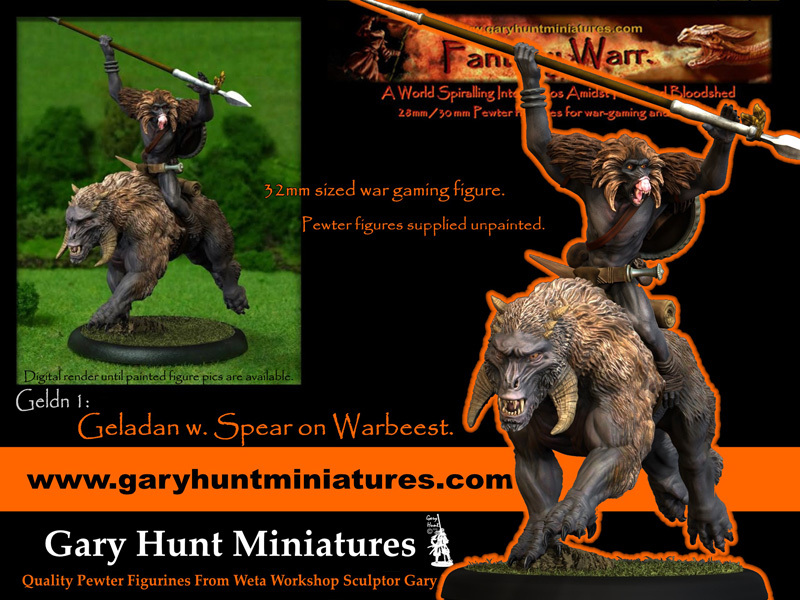 I may also be available ready assembled and inked in the Weta Cave and as a kit in Wargames Supply, Wellington. on the Memorial statue of Sir Keith Park. Sir Keith played a huge part in the Battle of Britain, WW2. "If ever any one man won the battle of Britain, he did. I don?t believe it is recognised how much this one man, with his leadership, his calm judgement and his skill, did to save not only this country, but the world." Marshal of the RAF, Lord Tedder. He also fought at Gallipolli and the Somme in WW1, the statue has now been placed on the fourth plinth in Trafalgar square. 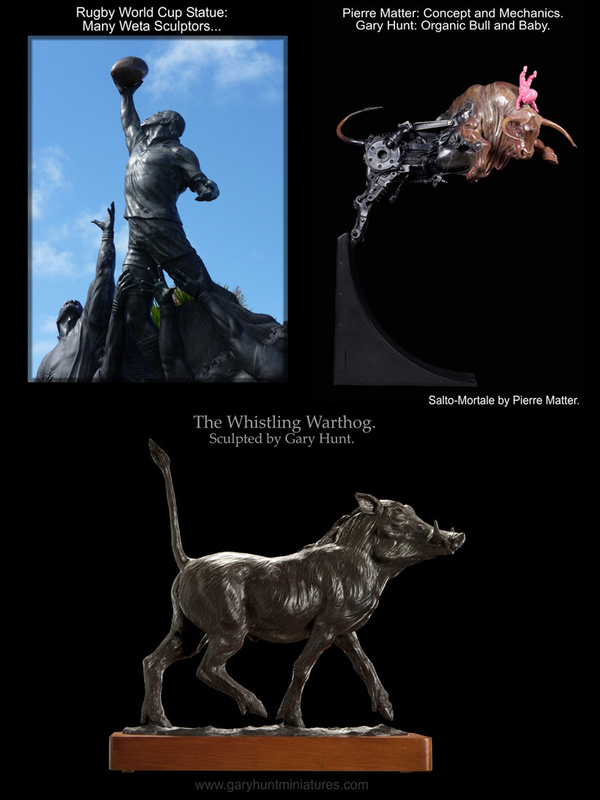 French Sculptor, Pierre Matter was working here at Weta workshop for 4 months, In that time I helped him on one of his original pieces, a leaping bull. It was inspiring to work with such a unique and talented sculptor. He blends mechanical scrap with organic sculpture, cast in bronze to create truly dynamic pieces. If you haven't seen Distrrict 9 already, check it out. My hat goes off to Neill Blomkamp, it was a great project to work on. Another blockbuster to look out for (at xmas is Avatar), Weta worked on it ( I only had a tiny bit of sculpture) and some scenes were filmed down the road at stone st studio's. Thought i'd show some digital sculpture and painting practice. 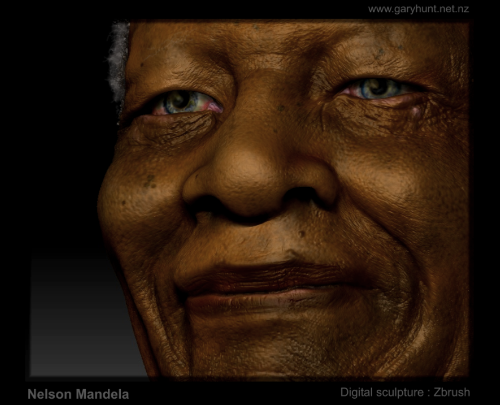 This is a portrait of Nelson Mandela using Zbrush. 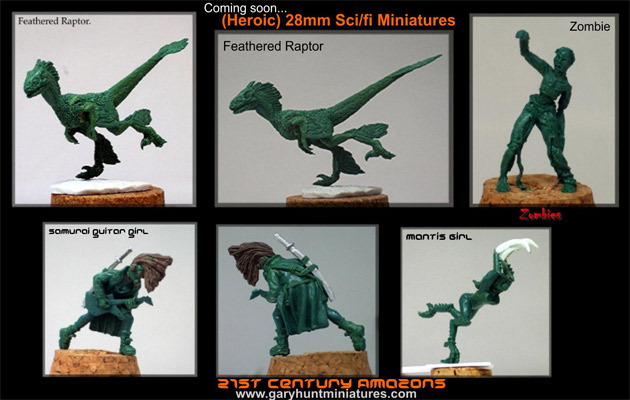 I've been working on 4 more packs for the 28mm Sci-fi range, the 21st Century Amazons. 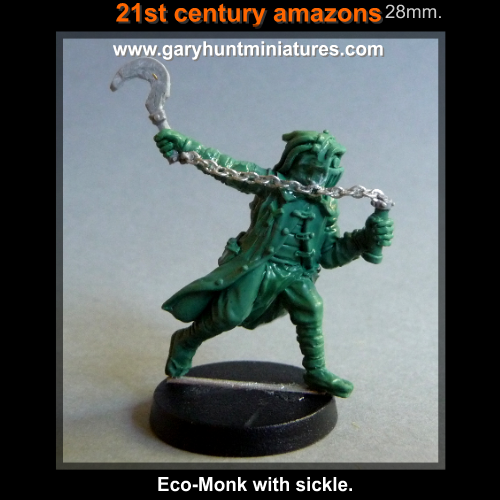 New packs of Eco-monk Mercenaries, Zombies and Amazons with guns.I'll be posting more images soon. 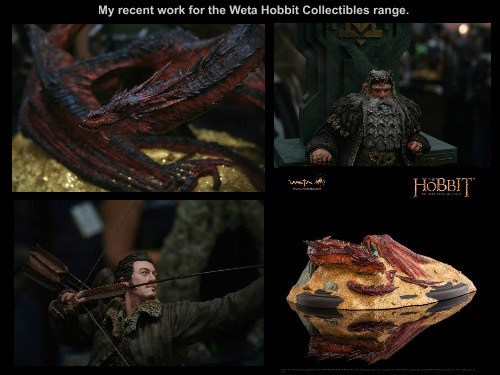 The Weta Cave https://www.wetanz.com/cave/ (Weta workshop, Miramar, Wellinton, NZ) now has a selection of both my 54mm and 28mm ranges on display and for sale. The latest of my 54mm historical releases is the Maharaja of Bundi, Rajasthan, India. 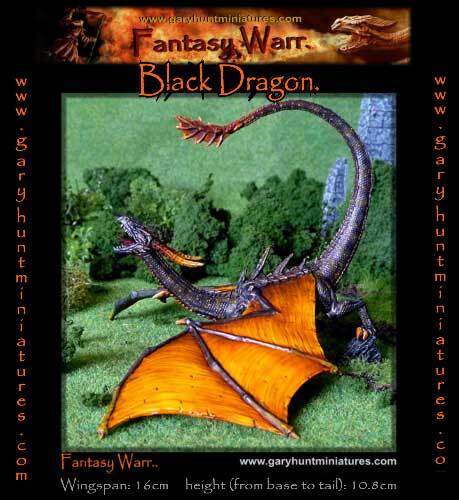 It is available on the website and also at Modelcrafts and hobbies in Wellington NZ. I've been working on some more 28mm figures for the 21st Century Amazon range, you can view the Chainsaw Monk and another Zombie on www.myspace.com/garyhuntportfolio photo's of these figures and other works in progress will appear here on my newsblog at a later date. 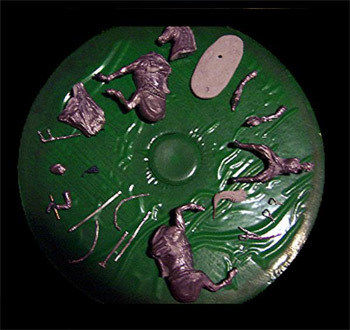 The Myspace page also has photo's of many other sculpts and more of my portfolio of filmwork. Ganesha games https://www.ganeshagames.blogspot.com/ have been creating some stats for feathered Raptors and mudmen, (they have a comprehensive system of post-apocalyptic rules:- Mutants and Death Ray Guns) and they will be in a supplement coming soon. 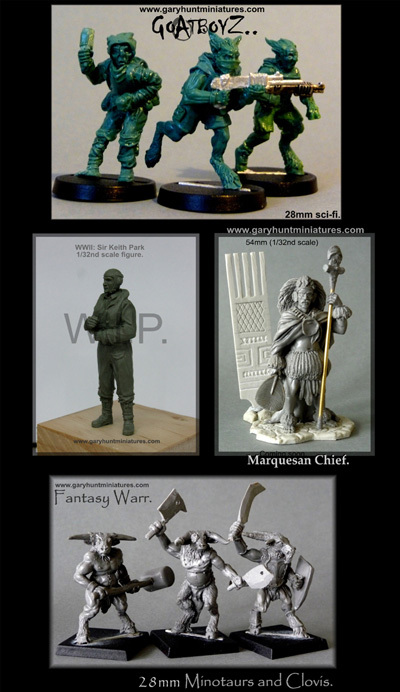 The whole range of 28mm sci-fi fantasy figures has now been uploaded, There are a total of nine packs so far, don't forget to check out the pop-ups for more pics. If you live in Wellington, NZ why not pop into Wargames supplies under the BNZ centre as they now stock, both my range sci-fi and historical ranges. 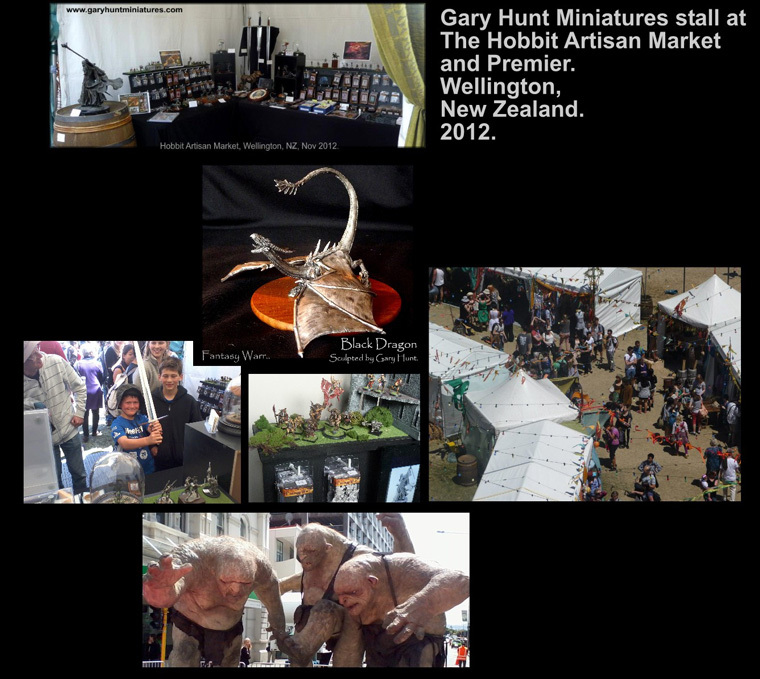 Modelcrafts and hobbies, cnr Victoria & Dixon st, Wellington Also have my Historical miniatures on display. And good news if you live in the UK, Bonapartes of Bath have my Historical 54's and will be taking them to the various shows in the country. I've made a start on a Weta heavy weapons unit for the 28/30mm range of 21st Century Amazons, here are some pics, I will also release a version as the two-sword samurai . The packaging casting and bases are ready for the Mudmen and Zombies, Raptors etc but I need to paint the range before adding it to my site, thats pretty close.....heres a sample scenario:- Mantis girls attack Mudmen and Zombies! Hi there everyone....my workflow on the new releases and 28mm scifi Amazons has recently been interupted - I returned to the UK to visit family and ended up staying 9 weeks longer than expected! I was working with a leading artist in London to prepare his next exhibition, It was great to work on such a large sculpture again and pretty inspiring......Well, now I'm back at Weta so i'll have to find some time to get my new sculpts ready for sale on the site...watch this space. 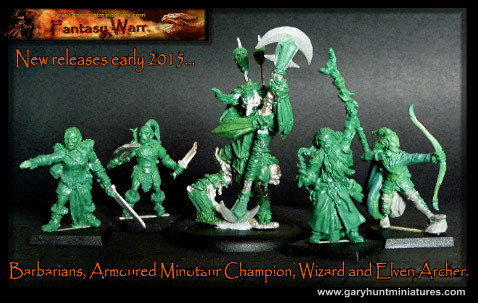 Here is a progress report for my 21st Century Amazons heroic wargaming scale range. I have finished a smaller Raptor, a mudman (with clay helmet and sharpened bamboo fingers!) another Mantis girl, the handler and another Zombie. More greens pictures coming soon. My website will eventually detail the world of the 21st century Amazons creating dynamic gaming scenarios for skirmishing and large battles. The Duke of wellington is ready, the casts are looking great. 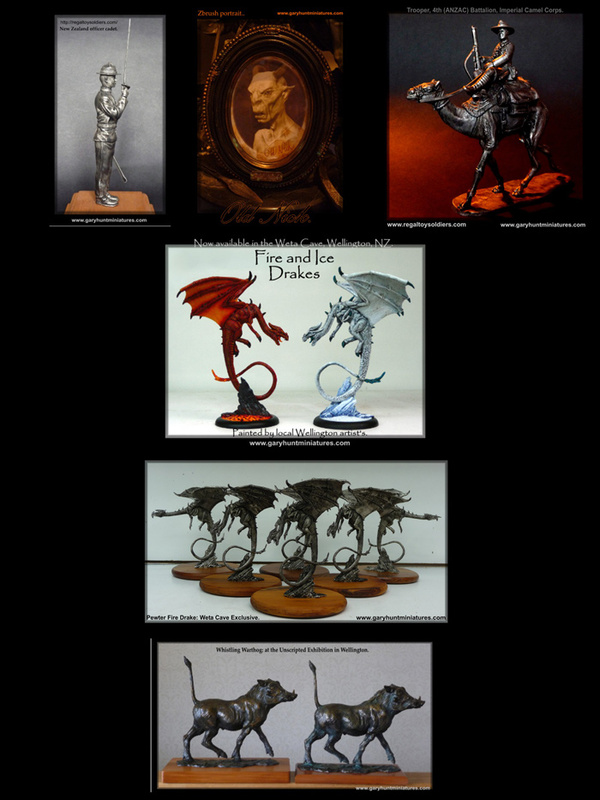 I will be adding the 21 peice kit to the miniatures purchasing page soon. The Iron duke, Sir Arthur Wellesley, Duke of Wellington 54mm kit is being Molded , I'll post pictures of it assembled very soon.... there will be 21 pieces in total. The 21st Century Amazons range is soon to be available in (heroic) 28mm scale, for use with generic wargames and skirmish rules, they also will make great character models and collectors pieces. I have many near completion. Here are a few pics of the first ones, there will be packs of the Amazons themselves and their various predators and prey (including Zombies). More photo's as they near completion. Here is a recent Zbrush (3d computer sculpting application) Head study, African Bushman elder, first attempt at skin texture. I have made progress on this addition to my 54mm range of pewter figures, The Maharoa Raja of Bundi, Rajastan, India, will be available to purchase soon. Another quick Zbrush head study...Gadaba woman. I've been dabbling in a bit of 3d sculpting on the computer using a program called Zbrush. Its early days but here are some of my early practice sculpts, just getting used to pushing the virtual clay around. the dragon was made from a single sphere, the hand from a series of Zspheres. I made into an armature into which I started sculpting, and the Neanderthal was made from a simple head and shoulders tool. Help save Whales and learn more about these amazing creatures at the Te Papa "Whales-Tohora" exhibition open from the 1st Dec - 11 May 2008. Wellington New Zealand. Euro Militaire in Folkstone, Kent (U.K) is getting closer. If you would like to meet for a chat and see some samples of my miniature range I will be wandering around the event on Saturday 22nd Sept. e-mail me on [email protected] if you would like to arrange a meeting time. I will also be in London and Somerset between 7th Sept - 29th Sept if you have any trade enquiries. If you are around Wellington (NZ) July/August the "New Dowse Museum" Hutt City has a King Kong Exhibition, Displaying some of the scannable maquettes we worked on, Digital Art Work from Gus Hunter and Jeremy Bennett, sketches, moving image footage, life size models/skulls and talks/workshops by Gino Acevedo, Greg Broadmore etc. 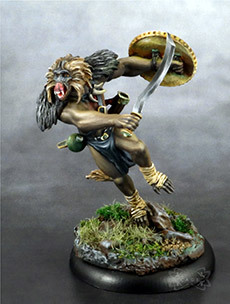 Miniatures by Gary Hunt The new 54mm Historical figure release is the Maori warrior advancing with Taiaha. 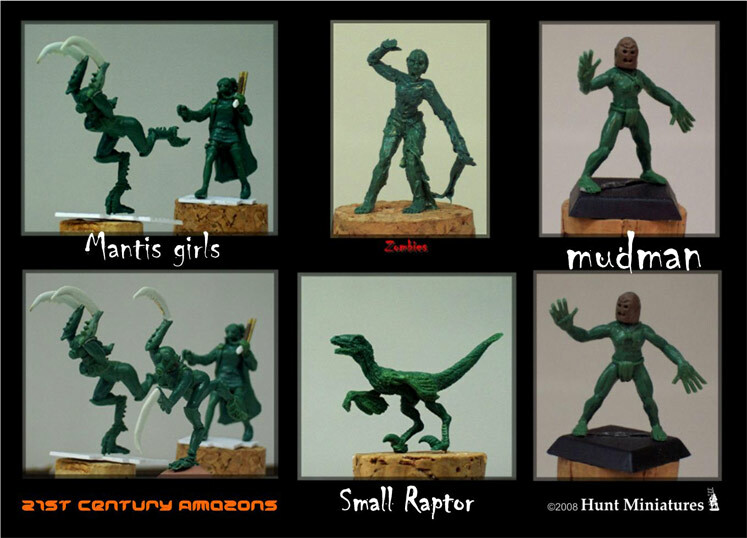 Due to requests to release the 21st century Amazons in 28mm I am busy sculpting the 21st Amazon range for gamers, this will enable me to create more characters and even vehicles...watch this space. I will be posting photo's of the greens soon. I have taken leave of my senses to commision the truely warped and twisted Mr Don Brooker ( Author and Illustrator of the X-ray comic book Cesspool and Sensations of the dead.) to create a sketch of the Mantis Girl. Here is the Brooker masterpiece in all its glory! Still working hard-out at Weta, it was a shame about Halo... hopefully it will re-surface one day. The Making of the Lord of the Rings Motion picture exhibition is now open in Te Papa, Wellington . It features some new models including the 1/72nd scale city of Minas Tirith (the White City of Gondor) and will be open until the 20th of August 2006.
check out the Venatasaurus bust, Venatasaur Attack, Kong Deluxe Chess Set and a King Kong with Ann bust . Dont forget the site also offers you the chance to view the NARNIA, Lion Witch and the Wardrobe, Collection. My personal favourite is General Otmin by Ryk Fortuna. The Wildly Inspired website is now up and running. aint it cool news, kong is king, one ring, comic con websites. in their MINISTRY OF INFORMATION, Lord of the Rings section. I've just finished painting the War mumak of Harad, by Games Workshop. This was a fun kit, its a pity that I couldn't find more time to paint it properly (there are quite a few flat colours). Anyway its a display model for my fathers shop back in England. www.wellsmodels.com (Wells Models, the Old Chapel Bakery, Union st, Wells, Somerset, BA5 2PU..01749 674908 if you want a look.) 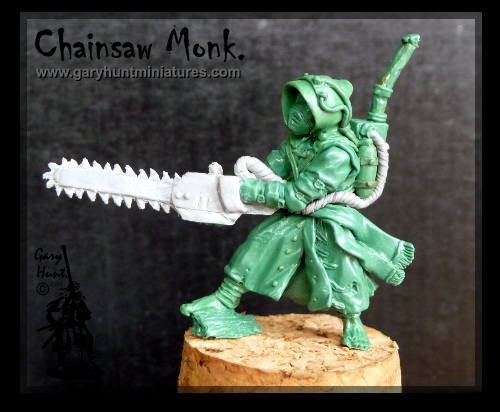 He stocks Games Workshop figures and many model ranges. WOW what can I say.........Icant wait to sculpt another collectable. Hello and welcome to my April news. Even though it's very busy at Weta Workshop I am still working on a few small scale historical figures in my spare time as there is some downtime from Wildly Inspired (maybe up and running again in Sept with new owner). I have also just taken on a small commission and would like to continue sculpting special characters for individuals with a passion for historical wargaming ,collecting and figure painting. 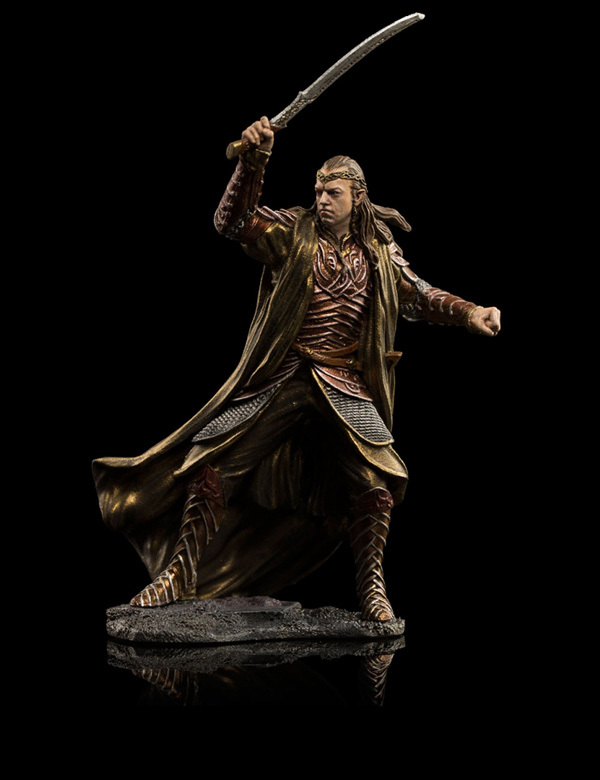 So if anyone has any specific command figures or one-off collectors peices that they would love to own and commision , I would gladly consider sculpting them, time allowing off course..
Gandalf the Grey Butter Sculpture. To celebrate the 50th anniversary of the 1953-54 Royal Tour of New Zealand. from the 15-19th January 2004.